These colors translated so good for me into a masculine birthday. What guy wouldn't love to shoot those birds out of that tree? I've got some men in our family that would think that was a great birthday. 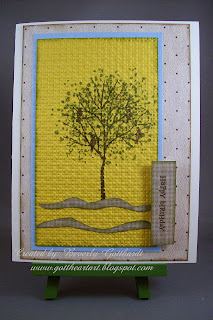 Stamptacular Sunday Challenge Challenge #59: Lovely As A Tree! Supplies: 5 1/2" X 6" Ivory Card Blank Halcraft, Papers: Stampin Up, The Paper Studio-Mirabelle Paper Pack, Stamps: Stampin Up-Branch Out, CTMH-C1257 Happy Birthday, Ink: Stampin Up-Soft Suede, Old Olive, Stampin Up textured impressions Square Lattice, pop dots. Beverly, what a wonderful masculine card! Thanks for joining us at SSC this week. 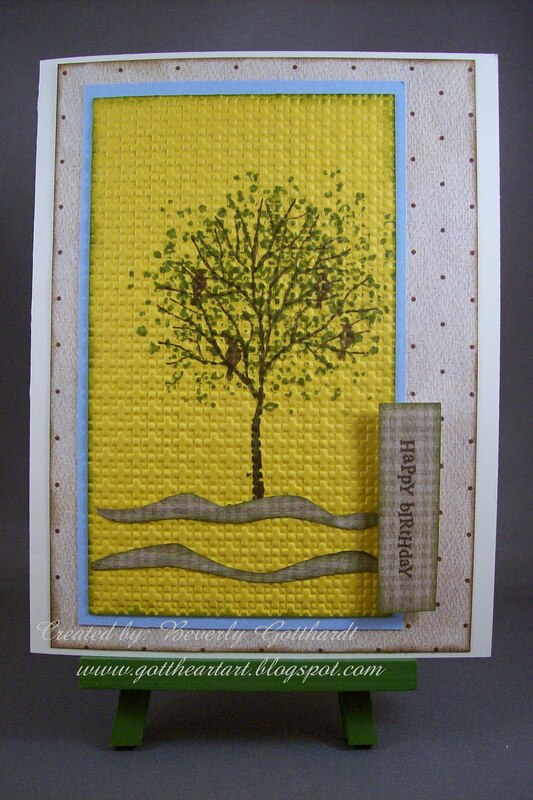 Love all the texturing you did on this pretty card. Thanks for playing in the color dare challegne. Such a beautiful card Beverly. I love your image it is perfect for the challenge. Thanks for joining in at SSC. Great guy card! Thanks for joining us this week at the OCC. Great texture. An excellent MANLY card! Thanks for joining us at Stamptacular Sunday Challenge. Sorry I have been absent...I LOVE this card. I love trees and this one is just fabulous.